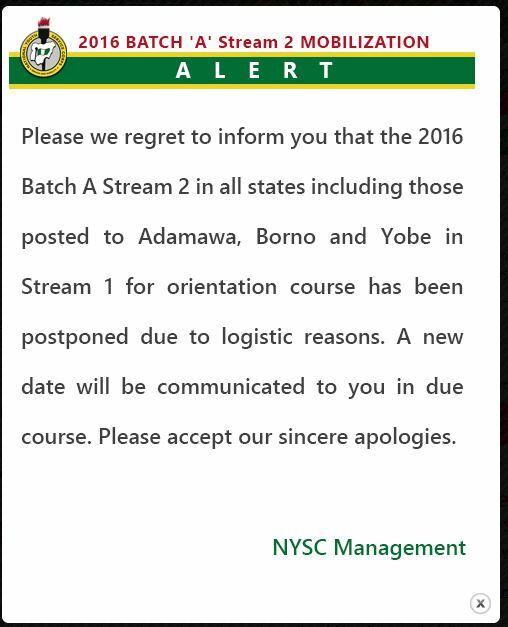 2016 Batch A Stream 2 NYSC Mobilization Postponed. Due to logistic reasons. This message was sent to some potential stream 2 NYSC propective corps members and can also be seen on their official website http://portal.nysc.org.ng/nysc2/home dated May, 19 2016. A screen shot of the message on NYSC official website is shown below. “Waiting” as always been the buzz word and also a habit for all prospective corps members to imbibe. All NYSC Batch A prospective stream 2 corps members still have to exercise more patience, despite the impromptu disarray of their travel plans and preparations made for Saturday’s journey. A new date will be made known to various Batch A stream 2 prospective corps members either later or sooner. But, before then, my advice to all prospective Batch A stream 2 prospective call members would simply be: Get something worthy of doing for the time being and keep abreast of any useful information that may surface sooner or later. NIMC National ID Card Collection is ongoing: Check Ur’s Here!